An official opening today marks a faster, more convenient prescription service for patients at Guy’s Hospital thanks to a partnership between Guy’s and St Thomas’ NHS Foundation Trust and LloydsPharmacy. Several changes that have taken place at Guy’s Hospital will help improve the service for outpatients. The new, larger pharmacy has relocated into the main building and a state-of-the art robot has been installed to help speed up the dispensing of prescriptions. The new site means that patients can now wait for their prescriptions in the adjacent atrium with its cafe. 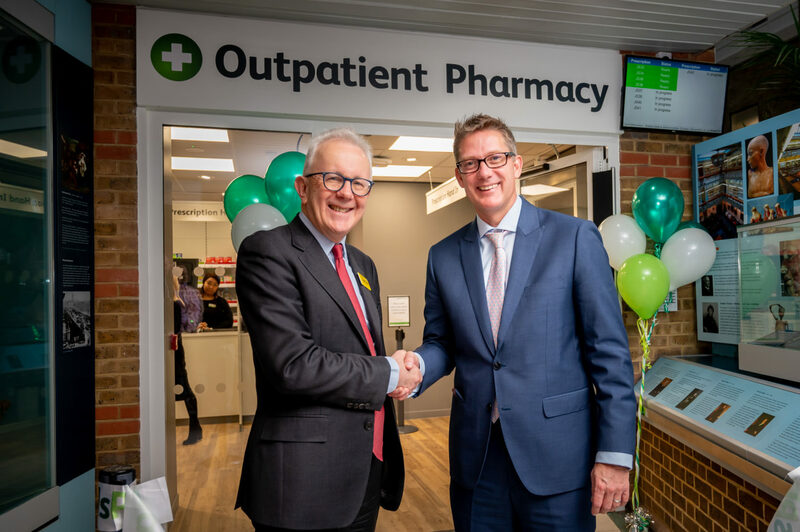 McKesson UK (which includes LloydsPharmacy) CEO, Toby Anderson, and Chairman for Guy’s and St Thomas’ NHS Foundation Trust, Sir Hugh Taylor officially opened the new pharmacy with a ribbon cutting ceremony. Toby Anderson said: “We are delighted to be working in partnership with Guy’s and St Thomas’ NHS Trust to help offer their patients the best possible pharmacy service and make a real difference to people’s health and wellbeing. Together, we’ve listened to what patients have told us to make it quicker and easier for them. We’ve more than doubled the size of the pharmacy with less walking time from the outpatient clinics. Queues have reduced as well as improving the experience waiting to hand in or collect a prescription. As well as the enhanced prescription service, the new LloydsPharmacy offers hospital employees and visitors retail and over-the-counter facilities, as well as the same professional advice and support that’s available in its high-street pharmacies. Sir Hugh Taylor said: “The new pharmacy provides a bigger and better environment for patients and allows staff to deal with the 18,000 prescriptions they dispense each month more efficiently. “It was very important that our patients were involved in the design of the new pharmacy to ensure the new space fully meets their needs and we are providing them with the best possible service. LloydsPharmacy has operated the outpatient dispensing service at Guy’s and St Thomas’ NHS Foundation Trust since September 2016. LloydsPharmacy became the first community provider of commissioned outpatient services for the NHS in 2009. It now has over 45 outpatient pharmacies with trusts to provide outpatient dispensing services.